It's long been rumored that Uranus reeks of farts. 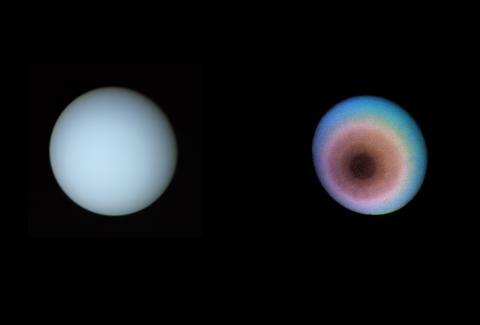 Uranus is, after all, a gassy giant. But now, a team of researchers have officially confirmed that Uranus is indeed a nauseatingly unpleasant place swirling with the stench of farts, and also so inherently lethal in other ways that it would likely kill anyone who ever attempted to visit. In news sending shockwaves through the space and pun enthusiast communities around the solar system, scientists have directly observed the presence of a molecule in the atmosphere of Uranus that confirms it smells gross. Specifically, they've found that it contains hydrogen sulfide in the concentration necessary to produce the sort of noxious rotten-egg stench reminiscent of a fart here on Earth. In a paper published in the journal Nature Astronomy, the researchers detail that they were able to identify hydrogen sulfide from afar using infrared data collected via the Gemini North telescope in Hawaii. They also note that the findings were somewhat surprising in that they also suggest the planet contains less ammonia than expected -- a fact that may help scientists better understand how it was formed in the early stages of our solar system. Uranus's fart stench would likely be one of the first things a visiting astronaut might notice if and when they descended into the atmosphere of the far-flung planet, but it would be a fleeting observation because the exceedingly harsh conditions there would probably quickly kill them before they were too bothered by the stink. "Suffocation and exposure in the -200 degrees Celsius atmosphere made of mostly hydrogen, helium, and methane would take its toll long before the smell," said the University of Oxford's Patrick Irwin, one of the study's authors in press release. Seems like everyone should probably just steer clear of Uranus.